To end judicial impunity for corruption crimes, we need to count on a robust judiciary, which is free of corruption itself. The focus, therefore, of our efforts is strengthening the integrity, independence and accountability of the judiciary as a key prerequisite for improving the capacity of criminal justice systems to detect, investigate, adjudicate and sanction corruption crimes in society at large. 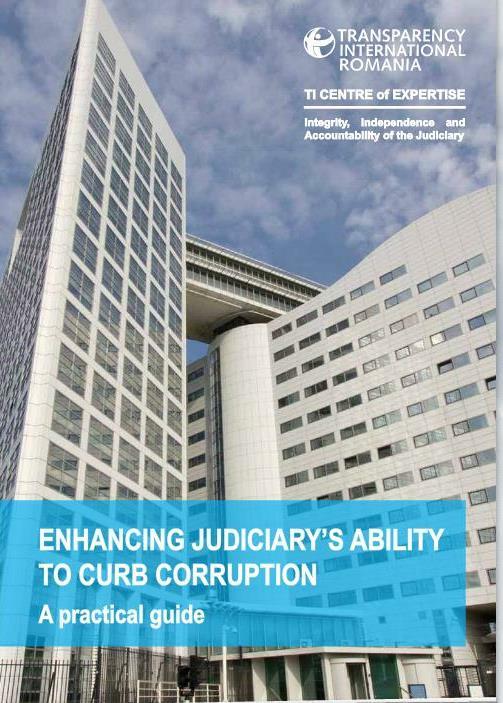 As internationally agreed standards and principles already established how judicial systems must be composed and actors in the judicial system must behave in order to act independently, transparently and accountably, we have systematized them into a practical guide to ‘enhancing the judiciary’s capacity to curb corruption’. The guide also brings the already existing TI expertise in the field, to provide governments, judicial actors and advocates with a set of requirements which, if implemented, can ensure the robustness of the judiciary. Moreover, the tool recommends adequate implementation tools. LAWFULNESS - requires judicial systems to perform the competencies prescribed by law, following only the laws and procedures emanating from the legislative body, and not from the executive. INDEPENDENCE - ensures that neither the legislature, nor the executive or any other outside actor has control or influence over judicial decisions. IMPARTIALITY - refers to the independence of judges and prosecutors to make decisions in cases free from interferences or considerations such as personal interests, undue influence from peers or political actors, public pressure, fear of reprisals, concerns about career prospects, political affiliations, bribery or other corruption-related issues. INTEGRITY - relates to the “behaviors and actions consistent with a set of moral or ethical principles and standards, embraced by individuals as well as institutions that create a barrier to corruption”. It requires judges not to place themselves under any financial or other obligation to individuals or organizations that might influence them in the performance of their duties. ACCOUNTABILITY – requires judges and prosecutors to account for their conduct to appropriate institutions established to maintain judicial standards, which are themselves independent and impartial. The judiciary is also held accountable by the media and public opinion. Judicial officials are not above the law. Judges’ decisions are subject to appeal and accountable to higher courts. TRANSPARENCY - laws, regulations, institutional structure, judgments and decisions are available to the public. Parties have the right to a fair and public hearing by a competent, independent and impartial tribunal established by law, and to receive a decision including its reasons, written in an accessible language. Court decision should be pronounced in a public hearing. PROPER ADMINISTRATION OF JUSTICE - requires judiciary to observes individual rights, provide victims with adequate remedies, apply proportional sanctions to the guilty, uphold constitutionalism and the rule of law, perform its duties in a timely manner, with professionalism and, ensure the best use of the available resources, ensuring predictability of its decisions and restoring trust in the judiciary. The Centre of Expertise Programme aims at strengthening the TI Movement’s advocacy capacity on the integrity, independence and accountability of the judiciary. Its focus is on strengthening the integrity, independence and accountability of the judiciary as a key prerequisite for reducing impunity for corruption.